Best Fiverr Text Logo Designer. A draft is sent within two days, usually much earlier. We can make small changes to it. Once you approve the draft, the final package will be delivered very soon. All lettering and signature text logos are of high quality with creativity. They're different from other Fiverr gigs designing ordinary logos using boring fonts. We put our clients at the first place. We will maintain a friendly communication, answer your queries in detail and guide you through the process of using Fiverr. 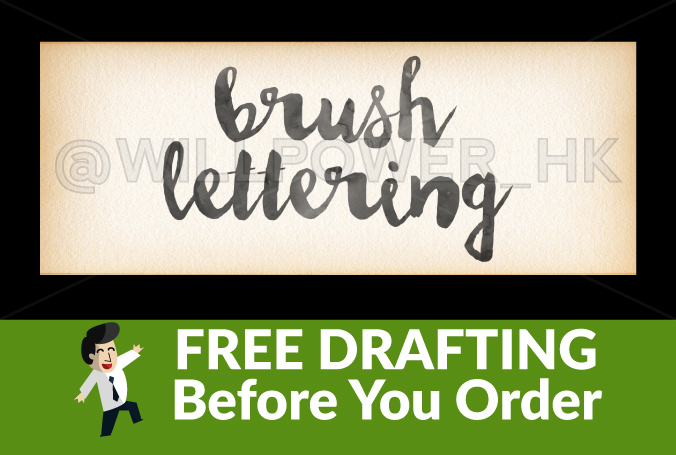 Unlike other Fiverr signature or lettering text logo gigs, we'll send you FREE draft before you order. Only order when you love the draft. Satisfaction guaranteed! Where else on Fiverr can you find someone to send you drafts and communicate so quickly without paying first? Right here. This Fiverr seller will definitely get my business again. Thanks! Really happy with my logo, Willpower_HK was great to work with, responded really quickly to requests, amended stuff when I asked, and explained tech stuff to me - a simpleton! Definitely recommend!! Thank you! This is exactly what I am looking for, and I couldn't be more appreciative of the work Willpower_HK did. He has great turnaround, fantastic customer service, and provides you with a high quality product. Very good Designer! Works very fast and can get my business operating ahead of schedule because of very good communication between myself and him. Highly Recommend based on speed from start to finish and the quality of his work! Register on Fiverr.com now so you can start ordering my service. Contact me on Fiverr to receive free drafting! ✓ No need to hold troublesome, complicated design contests. ✓ No need to spend time picking proposals on freelance sites. ✓ No need to pay over a hundred dollars for a high quality logo. ✓ No need to pay for unsatifactory text logos created by amateurs. We strive for the best buying experience of our text logo design services for Fiverr customers.